It’s getting chilly out and the holiday season is upon us. Somewhere beyond the loud SALE signs and super-saturated red and green displays is a gift that will put a smile on a loved one’s face. 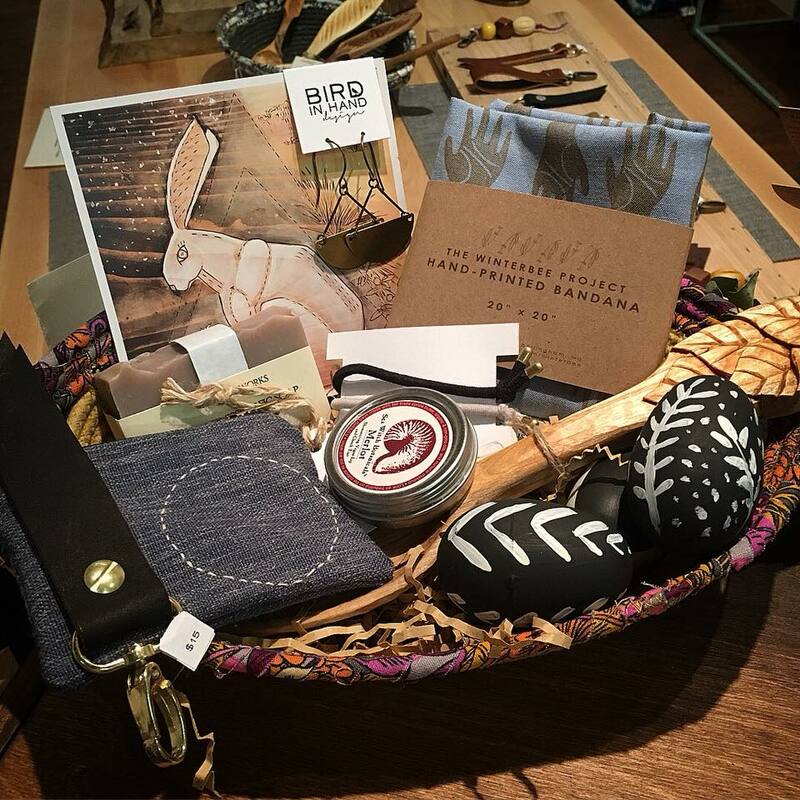 Say goodbye to mass-produced junk, and hello to the thoughtful purchases from local Bellingham shops. Entering Brazen’s doors brings you into a modern wonderland. It is the perfect spot to find gifts for all of your friends - think delicate jewelry, sassy pins, key fobs, sarcastic coffee mugs, waxed blankets for dry picnics, and so many more rotating gems. Peruse this small shop for artwork inspired by pop culture, Washington sports, and local artist creations. The shop owner designs many of the t-shirts, sweatshirts, prints, and more but he’s also curated an enticing collection of pieces from other Washington state artists, including Tumbleweed jewelry. Novato truly takes customization to the next level with hand-painted shoes and hats. Send them photos of cherished memories, funny moments, or unique designs, and they will create a work of art that is truly one-of-a-kind. Some of their designs have been featured on Sports Center, including shoes for Green Bay Packers Lance Kendricks. When you put in a $50 deposit, your order will go to the bottom of the queue. Since each item is hand-painted one at a time, there is no guarantee it will be completed before the holidays. Even so, it makes for a wonderful gift. Apse, short for All People's Shackles Exchanged, boasts elegantly simple rings, earings, bracelets, and necklaces for all genders. This jeweler has gone above and beyond to create The Bellingham Line, a collaboration of pieces representing local businesses, including many mentioned here. For example, the Heliotrope Sun Tracker Necklace is a functional sundial and an exquisite unisex statement piece. Give a piece of Bellingham, or another finely crafted piece from the Apse Adorn collection. The city that experiences minimal light in the winter also enjoys its coffee. Camber carefully selects brews and blends from around the world. A local favorite is the Ethiopian Yabitu Koba, grown 2,300 meters above sea level and packed with tropical flavors. Another is the sweet and citrusy Goodnight Moon decaf blend, the perfect flavor for whiling away the evening with a good book. For the caffeine lovers out there, order a rotating coffee subscription with a new blend every month. ﻿There are marvelous gifts to be found at Primer for friends and family that love brewing their own coffee. Select a glass dripper, a hand coffee grinder, or purchase an artisan treat. Primer’s famous Coffee Blossom Honey can be mixed into coffee or tea for a rich, sweet taste. Spread over fresh baked goods or mixed with fruit, it tantalizes the tongue with flavor. A living thing warms up a home like nothing else. As animals, we yearn to be immersed in nature. Our eyes light up when we see something healthy and green. We can’t always get out as much as we’d like, but we can bring something beautiful into each other’s lives. Baby Greens offers healthy, uplifting plants that make for gifts the entire family will enjoy and benefit from. Unsure what to get your friend who has it all? The Urban Collective selects only special pieces, many of which are produced locally. There is a little bit of everything, from crushed velvet pillows and plush rugs, to marble cheese platters and personal salt bowls. A treasure trove of wonders, Ormolulu fills its shelves with vintage and antique items as varied as snowflakes. Their style is best described as industrial chic - think vintage scientific beakers mixed with ornate, gold mirrors. Find something precious and unique for a collector you know. Bellingham’s local party shop provides quality cards and wrapping paper, hand-selected by the kind and creative staff. While you’re there, pick out high quality table settings for the holiday party. Give a gift that anyone will love! For locals needing a night out of the house or frequent fliers who can use some pampering, purchase a gift card to The Heliotrope Hotel. Then leave it up to them when it’s time for a vacation. If you know when your friends are coming to town, consider booking them a room.